Despite reports in national media outlets that a banner-carrying plane hired by Philadelphia Eagles fans to taunt the Dallas Cowboys crashed at Compton Airport, killing the pilot, the Los Angeles Times and other Southern California-based sources have confirmed that’s not the case. 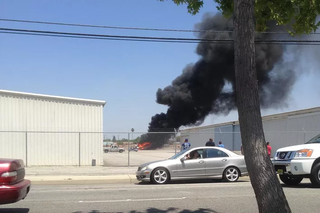 SB Nation’s Eagles blog initially reported that the “prank had turned into a disaster,” and indeed there was a fatal plane crash today at Compton/Woodley Airport. But eyewitnesses state that plane was attempting to fly a Bud Light advertising banner; furthermore, the pilot hired to fly the anti-Cowboys banner is alive and well, and spoke to the press. The initial story that surfaced went like this: Cowboys defensive end and domestic abuser Greg Hardy paid for a plane to fly a banner over the Eagles’ training camp that read “WE STILL DEM BOYZ!!!! #SACKSCOMIN.” That prompted an Eagles fan to start a GoFundMe to pay for a “WE’VE GOT DEMARCO” sky banner over the Cowboys’ practice in Oxnard on Sunday. When reports broke Sunday afternoon that a single-engine banner plane crashed at the airport—and the GoFundMe organizer learned the banner wouldn’t be flown—many, many conclusions were jumped to. This led to the SB Nation blog reporting the falsehood, after which Fox, Sports Illustrated, and others published their own reports—citing NBC Los Angeles as the source, but inserting a “fact” that didn’t actually appear in NBCLA’s report. Enkone Goodlow, an artist who rents a hangar at the airport, said he and some spectators had watched the pilot repeatedly try to hook a Bud Light banner. The banner was tied to a mastpole on the ground and the pilot would fly by and try to snare it with a grappling hook dangling from the plane before pulling up. Hi Nick, thanks for your thoughtful note. I did hear the rumor about the Eagles banner. Our photo desk sent a photographer to the airport and she found the witness I quoted, who mentioned it was a Bud Light banner. I shared your email with our weekend editor, who said he will ask someone to check again on the crash situation tonight. All this led to some very high eyebrow raising as to whether the validity of the reports floating around that tied it to the fan, as it very obviously would not have gone viral or appear on SI’s or Fox Sports’s websites without the tie to the training camp shenanigans. People were eager for an NFL-themed headline, and ran with it. The story is obviously a very tragic one no matter what kind of banner what flying behind the plane. A person is dead. That being said, it led to a storm of fans tweeting about the stupidity of the stunt; that’s fairly ridiculous, when indeed companies shill out money for banner-flying planes everyday without any such handwringing. It also heaped an substantial amount of grief on a seemingly harmless Eagles fan, who already has enough to deal with (being an Eagles fan, and all).